Update!! 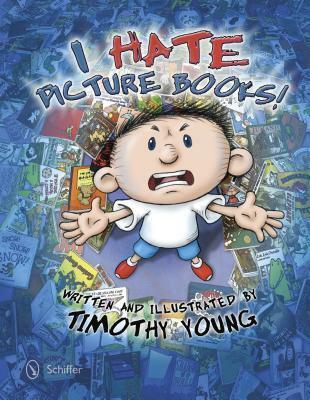 The amazing author of this book (Timothy Young) is holding a contest, where you can win ONE DOZEN of the books featured in I HATE PICTURE BOOKS - all signed by the author or illustrator (or both)!! Click this link to go to the contest page and download your entry form!!! The title of this picture book was so eye-catching that, without knowing anything else about the book, I knew I wanted to read I HATE PICTURE BOOKS by Timothy Young. So when I saw a chance to get a review copy from NetGalley, I jumped at it. And Yay!! They sent me a copy to review! Reading I HATE PICTURE BOOKS was the most fun I had in reading a picture book in a very long time! It's not only a story in it's own right, but a walk down memory lane, through all my favorite picture books. The little boy in this story decides that he hates picture books. He's going to throw them all away, because they cause nothing but trouble. (For instance, when he read Harold and the Purple Crayon, he got in trouble for drawing on the walls! Totally unfair!) The little boy puts himself (literally) into the pages of his favorite picture books, and I love the way Young captures the unique illustration styles and narrative tones of each of the picture books explored. I read it on my own several times over, and then read it to my kids too. Even my 15-year-old son wanted to sit on the couch with me to read this one! This is a must-have for anyone who has ever read a picture book.